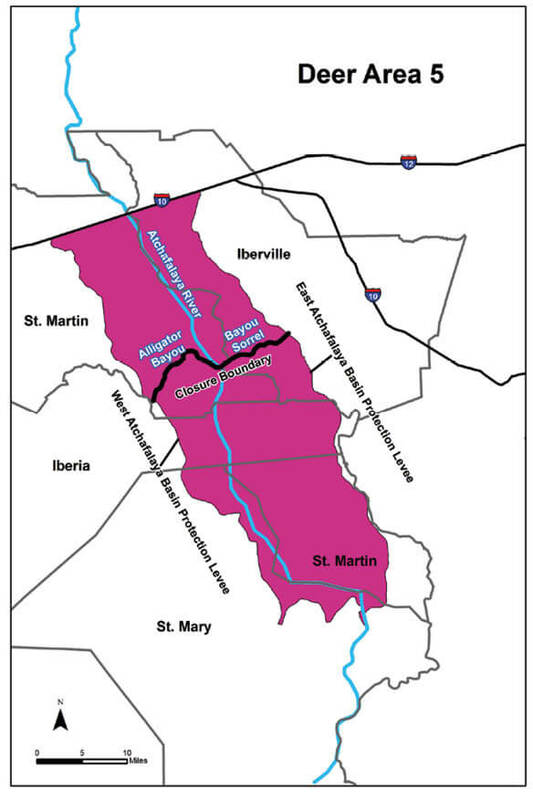 St. Martin South of I-10 and east of the West Atchafalaya Basin Protection Levee and west of the East Atchafalaya Basin Protection Levee. Iberville South of I-10 and west of the East Atchafalaya Basin Protection Levee. Iberia East of the West Atchafalaya Basin Protection Levee and West of the East Atchafalaya Basin Protection Levee. St. Mary East of the West Atchafalaya Basin Protection Levee. Deer hunting in those portions of Iberville and St. Martin parishes south of I-10, west of the East Atchafalaya Basin Protection Levee, east of the West Atchafalaya Basin Protection Levee, and north of Alligator Bayou and Bayou Sorrel will be closed when the river stage of the Atchafalaya River reaches 18 feet msl at Butte LaRose, and will reopen when the river stage recedes to 17 feet msl at Butte LaRose. Deer hunting in those portions of Iberville, St. Martin, St. Mary, and Iberia parishes west of the East Atchafalaya Basin Protection Levee, east of the West Atchafalaya Basin Protection Levee and south of Alligator Bayou and Bayou Sorrel will be closed when the river stage of the Atchafalaya River reaches 15 feet msl at Butte LaRose, and will reopen when the river stage recedes to 14 feet msl at Butte LaRose.